UPDATE: You might remember this old hand knitted blanket I found squashed in a plastic case all the way in the back of a closet. It had been knitted by my husband’s grandmother about 30 years ago and I don’t think it had seen the light of day since then. It was really quite dirty and uncared for but with a little cleaning it had been resurrected. Or so I thought. 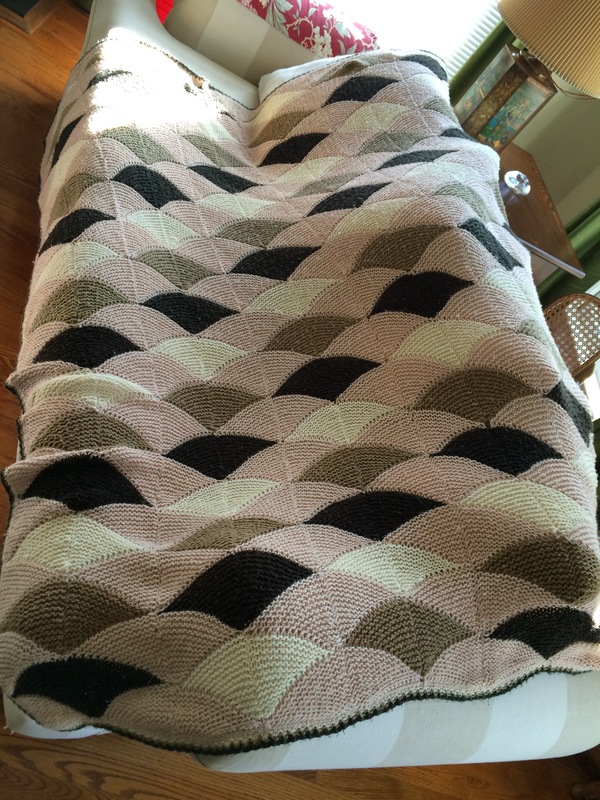 Hubby’s Grandmother’s blanket freshly washed after a 30 year absence. Looks good but smells … ugh! I’d used a fab product called Eucalan on it and, you know, the Eucalan was great for softening and cleaning the blanket but it came out of the washer with a very over-powering floral fragrance. It didn’t smell of the Eucalan which has a light eucalyptus scent. It smelled of flowery, chemically, dryer sheets and those floral airfresh refills and … I dunno what else. It was too much. Really. To the point of being awful, actually, and I couldn’t stand to have it near us much less try to snuggle under it 😦 In our home we don’t use air fresheners, dryer sheets, Febreeze-type products. I feel that clean doesn’t smell of anything and if there is some ‘freshener’ wafting in the air it is likely be trying to hide some nasty, odiferous, yuckiness lurking underneath. Now, I know some folk just love those fresheners and that’s just peachy but I.Don’t.Like.It! Hubby said that the blanket always smelled like that and that he was completely taken back to when he was a little boy when I brought the blanket out and he smelled it again. Huh. Maybe the years in the plastic had super charged the smell? Well, either way, it couldn’t smell like that and stay in my house. Bleck. So I washed it again but this time I added some plain white vinegar to the wash cycle. White vinegar is a great product to use in the laundry. When added to the final rinse cycle white vinegar will act as a natural fabric softener and will help combat lint and remove static cling. When added to the wash water is will strip out any leftover manufacturing chemicals from new clothes, particularly important when washing new baby clothes. Vinegar will also bleach out stains and freshen up whites and can be used to clean the machine itself of any soap scum and grime. Amazing right? WikiHow has some nice instructions on the quantities to use here. Just regular white vinegar from the grocery store. Easy. So I wondered if it might work to remove the overpowering fragrance of the blanket. I added a good slosh to the wash cycle, threw the blanket in and crossed my fingers. And you know, it worked! The smell was definitely much reduced…. but …. still more noticeable than I’d like. Gah!! What to do? I was running out of non-toxic ideas. I knew that the sun can really help strip offensive odours and stains from things like cloth diapers and I wondered if it might help me with my current dilemma. I laid the still damp blanket outside in the sunniest part of the garden for a few hours to see what would happen. Eureka! Success! When I brought it inside the remaining smell was all but gone and the blanket was soft and squishy and cosy again. Like a phoenix from the ashes the blanket has been resurrected – huzzah! Here it is all folded and lovely and ready to be turned in to the roof of a fort, or the base of a battleship, or just to snuggle under by the fire on cold winter nights. Love it! Yay! Great Advice and info. I will also add that white vinegar works really well when you need to get the urine smell out of pants worn by a two yr old potting training! Just soak them for awhile and fresher than new! Thanks for your tip, Ann! Sounds like you are speaking from experience re: 2yo potty training pants. Ugh, I remember those days. I love white vinegar for so many uses around the home. It is cheap, effective, and non-toxic. The true trifecta!